Veronica Luque is taking time to sit down at the kitchen table with her son, Angel. He’s a real cutie-pie, this round-faced, 10-year-old. His mom wants to know what every parent wants to know after school: How'd it go? "¿Qué pasó hoy en tu paseo de la escuela?" she asks in Spanish. What happened on your field trip? Angel looks up at her eagerly, trying to respond. But he keeps slipping into English, which his mom doesn’t understand very well. And she corrects his Spanish grammar along the way. He slumps, frustrated. "Matemáticas y como ... I can’t say it," says Angel. "Um, it’s, um, how… how do you say multiplication? It’s hard to say it." If Angel were literate in Spanish, he’d probably be more proficient in English by now. But he’s not proficient in either language, so he’s heading into fifth grade on the verge of becoming a Long-Term English Learner, a term used for kids who have been in U.S. schools for more than six years and still aren't fluent in English. His older sister, Lidia, is in high school. She knows what he’s going through. When she started school, she had to learn English, too. "It was difficult because I would always try to get other people to understand what I was saying," says Lidia. "But then they would try to get me to understand and I would get really confused. So I would just go be by myself or with someone else who spoke Spanish." Lidia at least had her Spanish to fall back on. She’s the oldest child, having moved to the U.S. with her parents when she was a baby. But her four younger brothers were all born in San Jose. Jose is in eighth grade, Angel in fifth, Bryan in first and Valentin in kindergarten. The boys have only had English in school. Even so, Angel is still struggling to prove he's academically proficient in it. "Sometimes I get bad on the tests," says Angel. "And sometimes I forgot to turn in my homework." One in four california students are still learning English. Almost all of them go to classes where it's the only language their teachers know. By law these students are supposed to get the same educational opportunities as everyone else. For thousands of kids, however, that’s not the case. From kindergarten to third grade, Angel's scores on the state’s English proficiency test barely budged. In fact, he was stuck at the same level for three years. He’s at an age now where the right teaching could make a big difference. In his fourth grade classroom at Luther Burbank School in San Jose, Angel looks up at an interactive whiteboard. His teacher, Janet Plant, uses the screen to go online and add photos and videos to her lessons. Plant says it’s crucial to make words visual. "It’s the same kind of idea of a visually rich classroom for preschoolers and kindergarteners," she says. "Because they’re learning in all these different modes." The essentials of strong teaching -- project-based learning, getting kids to participate and discuss what they are doing, kids showing that they understand -- is even more critical for English language learners, who must practice speaking and interact with their teacher in class in order to learn English. "So we’re going to have a writing assignment today about Sophie," Plant says to the class. "So what could we write about, a Sophie adventure story?" Angel answers, "Her and her dog friends on a quest." Plant says she often sees her fourth-graders talking in English with friends and answering questions fairly clearly. "And yet when it comes to the academic language ... that’s where they’re totally lost. Test taking, also, words like "evaluate" and "solve" being the same thing. If they have to answer the question, 'Could you please tell us why this happened in the story and give us some clues?' Instead of telling us why, they’ll tell us what happened." Veteran teachers at the school like Plant have gotten frustrated as programs have come and gone over the past 30 years. There was bilingual education until California banned it in 1998. Now it’s English-only. Some schools get waivers to do dual immersion or bilingual programs. But not Luther Burbank -- it does what is mandated, pulling Angel and other English language learners out of class to get 30 minutes a day of English language development. "Which usually works out to 25 minutes once they get seated and get their workbooks," says Plant. "So I have this very quick lesson, which is academic vocabulary and experiential situations. It’s not enough." Research shows a lot of teachers just don’t understand how to teach English language learners. "Teachers mostly don’t know how to teach language," says English-learner researcher Laurie Olsen. "They teach subjects or curriculum, but they don’t know how to listen to what’s happening with language, they don’t know how to model language. That has been a huge problem." Yet we do know what works. Miner Elementary in South San Jose’s Oak Grove School District is one of more than a dozen Bay Area schools piloting a model called Sobrato Early Academic Language, or SEAL. It was developed by Olsen. The first thing you notice here are visual strategies -- colorful posters, words and diagrams -- in every classroom. Teachers have ditched the workbooks. They want students to lead discussions and talk -- a lot. Every lesson puts language first. The bigger the words, the better. Teacher Julie Federman coaxes a shy kindergartener named Alfred to show off his new marine biology knowledge. "Could you tell me about the food chain? And we’ll start with the kelp at the bottom. What happens?" "Well, the kelp is eaten by the crab," says Alfred. "Then the octopus eats the crab. Then the octopus is eaten by the whale." Alfred came to school speaking hardly any English. Now, he's using big words like "octopus" and speaking in complete sentences. Federman says she doubts he would have made this much progress with the school’s old, more traditional methods. "I can see so much growth and mostly engagement, student engagement. Everybody’s excited about learning," says Federman. The goal of the SEAL model is to make kids fall in love with language. And not just English. In this approach, parents are also encouraged to keep building their kids’ first language, reading to them at home to help them become truly bilingual. But perhaps the most important -- and challenging -- piece of the new model is retraining teachers. "It’s over a two-and-a-half-year period,"says Paula Cornia, the English learner administrator for the Oak Grove district. "And it’s very intense, but it’s very successful. I’ve never seen a program this successful." 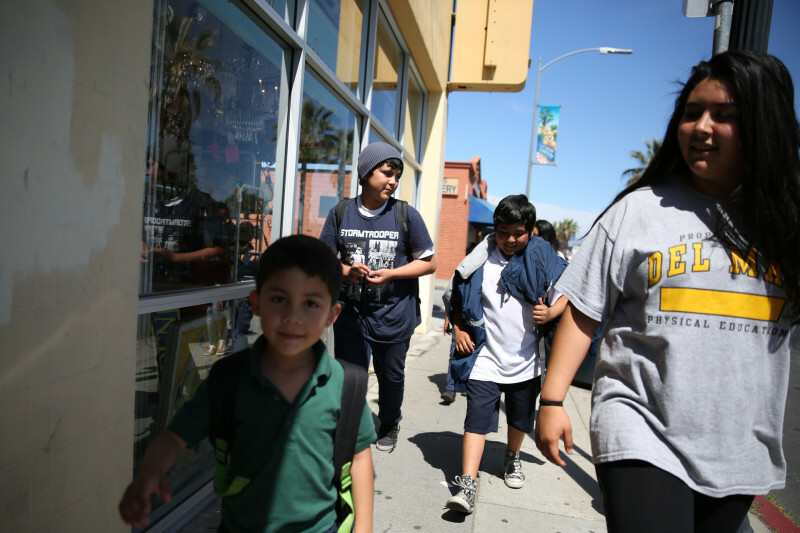 Just last year, California adopted a new framework for English learners. It calls for all teachers to chip in to a “whole school” effort, like the one at Miner Elementary. This could give English learners a lot more practice in using academic language. "To have English language development within the content itself, as core in your content classes and demonstrate to teachers that they really need to attend to language as they communicate their content, that’s a nuance that had not been so prevalent, so noticeable, so blatant," says Elena Fajardo, administrator for the state Department of Education's Language Policy and Leadership Office. "The extent to which it is necessary has become very clear." Counties and districts across the state are retraining teachers on how to deliver language instruction while teaching other subject matter. That could be good news for younger kids like Angel. His mom, Veronica Luque, is counting on her children’s schools to help secure the family's future. 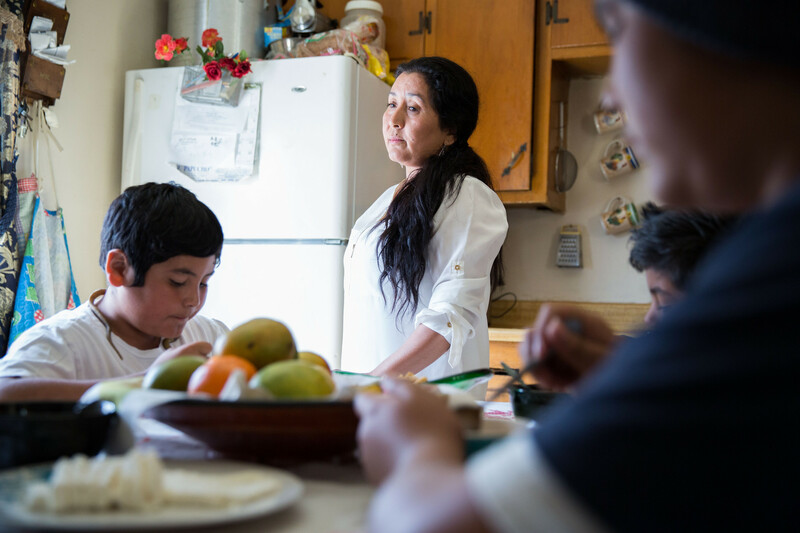 "The best legacy that we can give them is helping them in their education, so they can go to college and have a good job and not struggle in the hot sun like their dad does, just to pay the rent and buy food," says Mrs. Luque in Spanish. "I want them to have an office job or the option to work from home if they want to and earn money without struggling." This year, the Luques' youngest son, Valentin, started kindergarten. 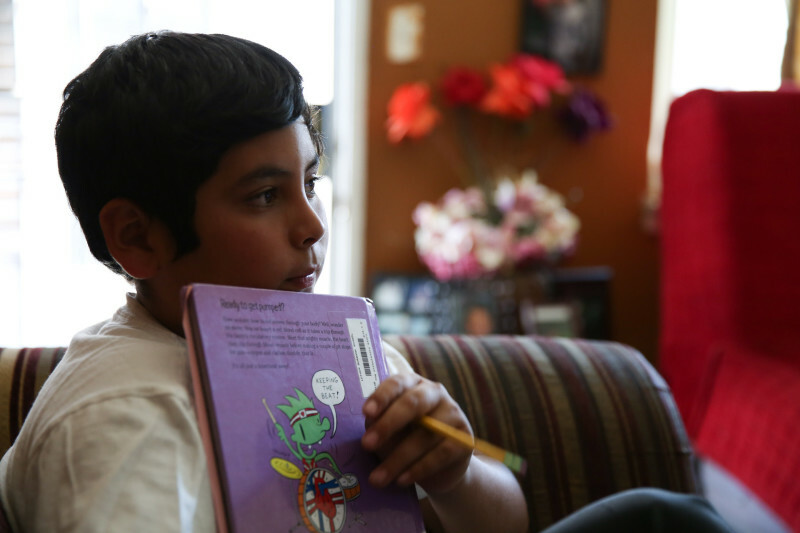 He's one of thousands of new English learners entering the system: another chance for the state to get it right with this next generation of Californians. 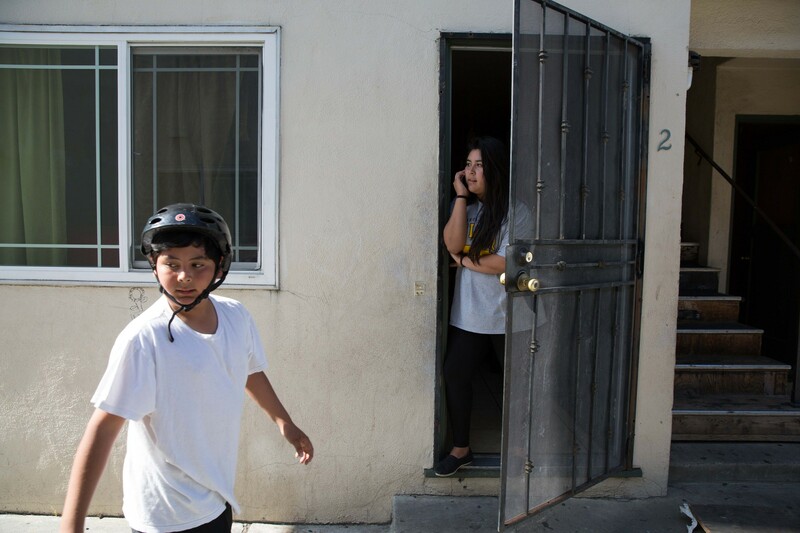 This the third story in a three-part series about what it will take for California to succeed with the nearly one-and-a-half million students in public schools who are learning English as a second language. To read about Angel's oldest sister Lidia and her success in school, go here. 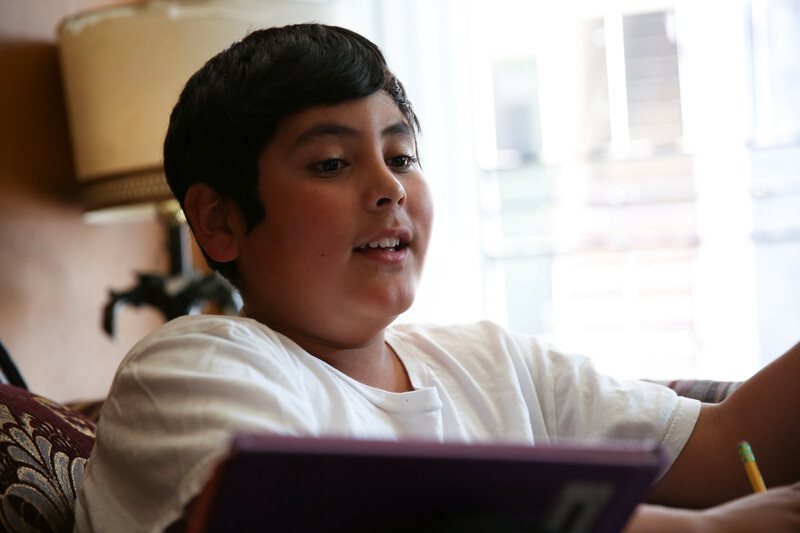 To read about Angel's eighth-grade brother, Jose Daniel, and his struggle to be considered proficient in English, go here. This story was reported in collaboration with Renaissance Journalism’s Equity Reporting Project: Restoring the Promise of Education, with funding from the Ford Foundation. Zaidee Stavely contributed to this story.